Precise Hearing is your source for quality Resound Hearing Aid Parts including Tubes and Domes. Resound Domes are comfortable and non-occluding! They will fit all Resound Sound, Thin and Flex Tubes to make a slim-tube Earmold. The ReSound domes slide over the end of the ear canal end of the Tubes. Although the Domes fit snugly on the Tubes they are easy to get on and off. Tip: It is recommended that hearing aid domes are changed every 3 months, more often if need be to ensure maximum performance. 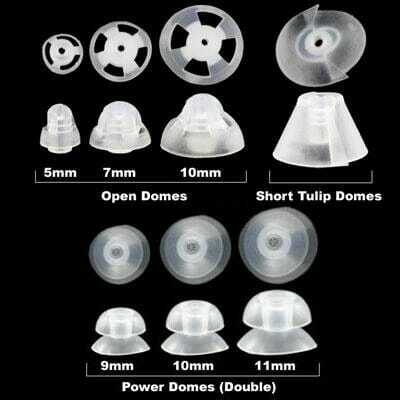 Domes can be removed from the tubing and cleaned separately. Before inserting into the ear be sure that the new dome is pushed firmly onto the tubing.